If you have studied the recent history of Japan, you probably know World War II ended for the nation on Aug. 15, 1945, when Emperor Hirohito made his famous radio broadcast announcing Japan’s unconditional surrender, as demanded by the Allied powers in the Potsdam Declaration. Technically, though, you are wrong: Notice of the declaration’s acceptance was published in the Kanpo, the official gazette of the Japanese government, during the waning hours of the previous day. Admittedly, the Allies probably weren’t subscribers at the time, and the Japanese people didn’t know until the next day either, but publication in the official gazette is what makes things real — officially, at least. Dating back to 1883, the Kanpo is how the government gives official notice of its doings. Published by the National Printing Bureau (which also produces Japan’s bank notes, stamps and passports), it was first available only in paper form and delivered to subscribers and outlets around the country. This meant it might take a day or more for hard copies to hit the ground in some parts of the country. However, in a 1958 ruling the Supreme Court case upheld (of course) the sentencing of a defendant to enhanced punishment for narcotics offenses that took effect before the Kanpo announcing the relevant amendment could have been delivered to his location. In theory, basic tenets of democracy and justice hold that people should have prior notice of the laws and regulations they are supposed to obey. In the real world, for people to be suitably informed would require them to spend all day reading the Kanpo instead of doing more useful things like filling bags with potato chips or removing brain tumors. Published most weekdays in a main volume, one or more overflow or extra volumes and usually a separate volume devoted solely to government procurement, the gazette generates a constant torrent of information about the workings of Japan’s government. There actually are people who pore over the Kanpo, but many of them probably work for the government. By one account, government institutions account for about 40 percent of subscriptions. You too could subscribe to the paper version in Japan, though there is a searchable version that can be accessed over the internet. As you might expect from a Japanese government IT system, though, you can only use it after first sending in a paper-based application by post and getting your login credentials the same way. You can at least see the table of contents of past issues, as well as some of the contents of recent issues online for free at Kanpou.npb.go.jp. So what appears in the Kanpo? Pretty much everything that matters and lots of stuff that doesn’t — not to you at least. It is the medium by which national laws and regulations are promulgated — that is, announced to the nation — and other government actions are explained. The July 13 issue, for example, promulgated amendments to the Civil Code protecting the inheritance rights of spouses in long-term marriages to the marital residence, together with an entirely new law establishing a system for registering wills at legal affairs bureaus. Amendments to organizational regulations of the Financial Services Agency were also put out the same day. July 27 saw the promulgation of the casino resort law the Liberal Democratic Party rammed through the Diet a few days earlier. Other things get published too. Those annoying questions opposition politicians present to the government are posted in the Kanpo, as are the government’s official responses. 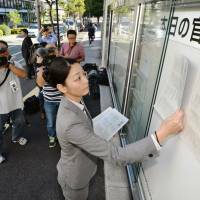 The July 12 Kanpo alone reported 12 responses to questions raised from members of both Diet chambers, on matters as diverse as overtime rules for “high-level professionals” and the recent U.S. F-15 fighter crash at Kadena Air Base on Okinawa. If you are an Imperial family buff, the gazette lets you track them. According to the Kanpo, the Emperor and Empress spent July 9 and 10 visiting Shizuoka Prefecture. On July 6 Empress Michiko attended a concert of the Japan Philharmonic Orchestra in Tokyo, and the Emperor sent a telegram to Turkish President Recep Tayyip Erdogan congratulating him on his recent re-election. Those interested in the inner workings of the government can follow the careers of technocrats through the Kanpo. The July 11 issue contained two full pages announcing transfers and appointments of judges, prosecutors and other bureaucrats. You don’t need to be a public servant to get your 15 nanoseconds of fame in the Kanpo. If you naturalize as a Japanese citizen, get declared bankrupt or pass the bar exam, your name (and, depending on the notice, address) will be published. 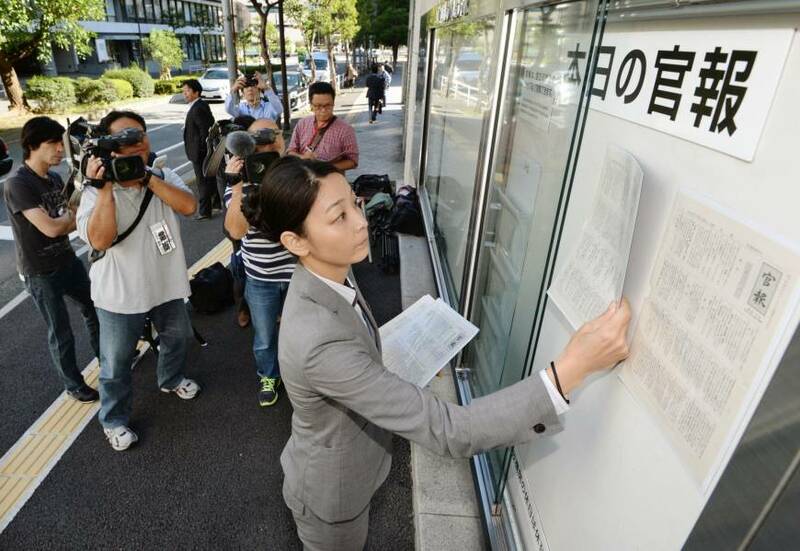 The July 13 issue gives notice of dozens of people whose petitions to naturalize were granted by the Justice Ministry. Those who naughtily retain or acquire a second nationality can also theoretically lose Japanese citizenship through Kanpo notification. Corporate housekeeping is also conducted through the gazette. Some companies choose to use it to give statutory notices to their shareholders, while the posting of certain notices — of a corporate dissolution, for example — are mandatory. Courts also use the Kanpo to give notice of proceedings that may be of interest to persons unknown or unreachable. A form of “naming and shaming” also takes place through its pages. Lawyers guilty of professional misconduct are written up, as are those guilty of the lesser transgression of losing their lapel badge and needing a replacement. The Kanpo is used principally by national government institutions. So you can’t use it to stay current on the latest local garbage-sorting regulations. Nonetheless, some local matters are required to be noticed through it. The most common type seems to be notices of “itinerant dead people,” those found dead but whose names or domiciles are unknown. These sometimes go into macabre detail about the manner of death and the personal effects and clothes of the deceased. On June 1, a 66-year-old man was found dead from a self-inflicted wound in a cemetery in Takarazuka, Hyogo Prefecture. On June 16 the body of a man in his 60s was found in Nishio, Aichi Prefecture; his left ring finger had a ring bearing the inscription “MtoT #18 Pm900 75.2.26.” He was cremated and his ashes were available for pickup when this melancholy notice was gazetted in July. It’s not all bad. Leading citizens awarded public honors are listed in the Kanpo. Granted, not all are alive to enjoy the privilege, since one category of honor consists of being accorded a posthumous ranking based on notional proximity to the Emperor. You can even find poetry in the pages of the Kanpo. Starting the year with poetry is an ancient imperial tradition, one perpetuated today through the annual utakai hajime gathering convened by the Emperor in early January. The previous year, the Imperial Household Agency invites the public to submit verses, and the authors of those good enough to be selected are invited to the event and their poems published in the gazette. Ironically, although the Kanpo is used to promulgate the nation’s laws, there is no legal basis for doing so. Before the postwar Allied Occupation, there was an imperial edict that mandated promulgation of laws and regulations through publication in the Kanpo, but it was repealed by the Occupation authorities and never replaced. The continued use of the gazette — by default — is thus an interesting example of what is essentially a high-level rule of customary law. The gazette is Japanese-only, except there are English summaries of public procurement opportunities. During the Occupation, however, there was the Official Gazette: English Edition. Now available through an online archive operated by Nagoya University, this version was presumably necessary so the Americans running the show from behind the scenes could keep track of everything. This actually relates to one of the quirky things about the Japanese Constitution. It essentially represents a part of a negotiated compromise across languages, starting as an English draft presented by the Americans and changing through the subsequent back-and-forth between them and their reluctant Japanese counterparts over not just substance but how it should be expressed. The English version is what was “promulgated” in the English Kanpo at the end of this process, but it is not just a simple translation of the Japanese. The Japanese is the only version that matters, but due in part to this history, the English version can sometimes mislead. A few years ago I proposed in a Japanese newspaper op-ed that one way to test the nation’s appetite for constitutional change would be to amend the English version so it was a proper translation, rather than a parallel version in a different language. I thought (wrongly) that it might spark a useful debate on the Constitution as a whole rather than whatever bits Prime Minister Shinzo Abe and his cohorts want to talk about changing this week. More to the point, it could be accomplished without the formal amendment procedure. If such a translation were done, though, it would probably be published in the Kanpo. There is even a precedent of sorts. In the Sept. 3, 1986, issue of the Kanpo, the Foreign Ministry announced it was correcting the official translation of the 1949 Geneva Convention on the Treatment of Prisoners of War. Japan had acceded to this treaty in 1953 but gazetted it with a sloppy Japanese translation. Better late than never. Notice of a real constitutional amendment would of course be published in the Kanpo. But as of today there are still no precedents for that.